The rapidly expanding choice of motorcycles in the middle-displacement segment makes things very interesting. Not that we couldn't do with more, let me hasten to add. What is really intriguing is that our newness as a market allows us to grab motorcycles by the neck and make them do things they weren't meant to. It makes decisions harder than, "I just need an adventure tourer" and it makes choices very interesting, "I'll get a street bike and go touring." Oh yes, variety is the spice of life. Today we have two machines that came out recently. Both have proved to be very impressive in their own ways. In most of India, the Kawasaki Versys 650 is priced Rs 60,000-odd less than the Triumph Street Twin. In Mumbai, sigh, thanks to Maharastra's idiotic new rule about CBUs, the difference balloons to a criminally insane Rs 1.6 lakhs. That's not taxation; it's robbery. Let's look at the two machines in terms of their ability in the three environments where they will spend the maximum time  the city, the twisties and the highway. Neither, let's agree, has off-road or racetrack intent. But first a quick recap of the bikes. The Kawasaki Versys 650 is based on the same platform as the Ninja 650. Its trellis frame is identical but the rear subframe is different to accommodate luggage and a pillion. The Versys has superior suspension with a preload adjustable front and rear, and it rides higher as appropriate for an adventure tourer style motorcycle. ABS is standard. The parallel twin engine is slightly retuned for torque trading in power on top for more torque down below. But surprisingly, the Versys 650 motor feels vastly more enthusiastic and smooth compared to the Ninja 650. That alone changes the nature of the motorcycle. You never expect the Versys to be as effervescent a motorcycle as it always proves to be. The Triumph is brand new. The Street Twin uses a mild 900cc twin-cylinder engine that makes only 55PS. But Triumph has been shrewd in tuning it for extraordinary torque. You never feel a lack of power, and the Street Twin feels eager and urgent to ride despite the modest power output. The chassis is also all-new featuring a soft, controlled ride quality matched to unfussy, competent handling. 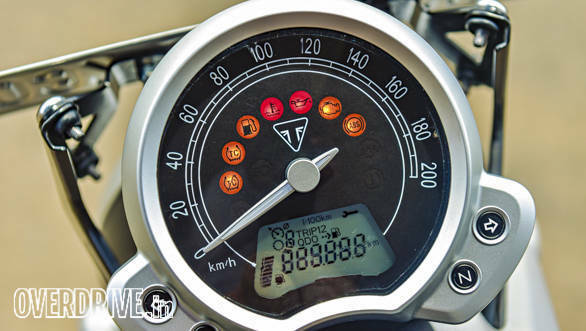 Now equipped with ride by wire, the Triumph gets traction control and ABS and in that sense is well-equipped. The Triumph has a clear edge here. The Street Twin is tiny in dimension, and like the old Bonneville it has a startlingly low seat. Both of these are huge assets in city work. The Street Twin is easily squeezed into the smallest of gaps, and stopping, starting and slow U-turns present no problems except for a noticeably strong sense of weight. The smooth, abundant torque makes gear selection optional, and you can usually just leave the Street Twin in a fairly high gear and waft about swiftly and quietly. The red test bike we road tested earlier had a fruity aftermarket exhaust, but this black one is completely stock. And to my ears much nicer with its quieter thrum. Swift commuting on the Street Twin is effortless and rather enjoyable. The Versys, however, is far closer than you expect. The size of the fairing, especially next to the Triumph, suggests an unwieldy commuter. But you'd be shocked. The taller seating position allows you to spot more gaps, as well as to be spotted by traffic. This produces an astonishingly effective commuting platform that slices through traffic with a precision and pace that you never quite expect. The trouble, of course, is the 840mm high seat which means shorter riders will struggle with stopping and starting repeatedly in traffic. But just like the Street Twin, the Versys has a torquey engine, and while it isn't quite as explosive as the Triumph, the Versys can also be left in a high gear and automatic-ed through traffic. If anything, the Kawasaki twin is just a bit silkier and smoother to use. The other advantage is the Triumph has the full complement of electronics. Traction control is basic in nature rather than the sophisticated system you'd get, say, on the Ducati 821 Monster but it works. The point is in the highly variable conditions of the city, the Triumph casts a bigger safety net than the Versys 650, which only has ABS. The Versys 650 has the clear lead. And unlike the city, it isn't close. The Versys 650 swallows up highways smoothly at elevated speed. The adjustable screen, comfortable seat, big tank and superb suspension come together to create a nearly flawless package. Even with luggage and a pillion, I'd be hard pressed to pinpoint a better tourer in this price bracket. 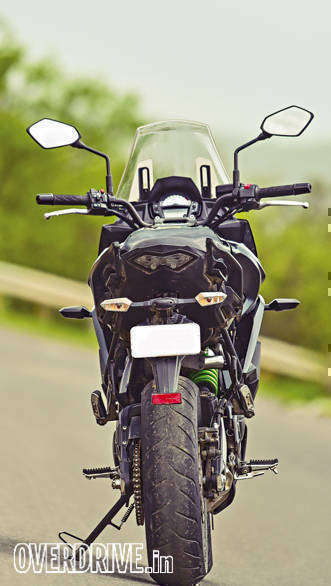 The ground clearance and the suspension travel also means that the Versys will take broken roads and soft roading in its stride which only increases its relevance in our conditions. As I've often said to my friends, if it wasn't for my regular racetrack visits, the Versys would already be in my garage. Affordable price and low EMIs means the buying threshold is low as well. The Street Twin has a harder time out on the highway. Torque and power aren't the issue though. 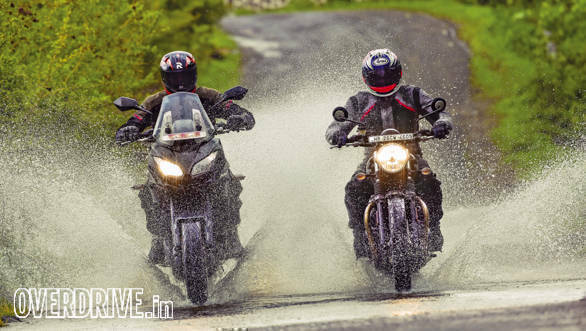 130kmph cruising comes as naturally to the Street Twin as the Versys. But there are two issues. First, there's a slight increase in vibration between 100kmph and 120kmph which means riding slower or faster than this feels better. Which is strange - that's the range highway work is usually accomplished in. Second is the lack of protection from the wind. 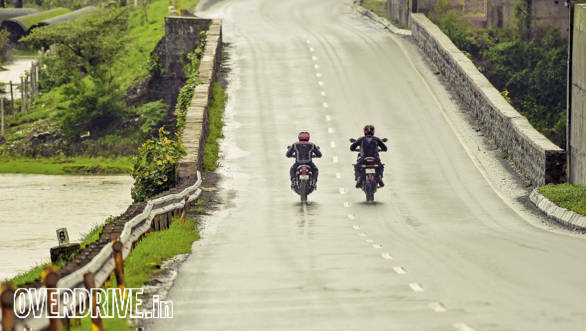 A sustained 120kmph cruise will leave you with an aching neck. But as Rishaad points out, the Street Twin is a very good tourer if you pare back the speeds. Cruise at 80 or 90 and you'd think world peace has finally been achieved. Either that or you have to get a screen and take the windblast off. What the Triumph cannot match is the sophistication of the Versys' suspension. The Street Twin is very good on its own. It feels like a good balance, offering a stable non-wallowy set-up that's not too stiff. You feel small bumps just enough to get a sense of traction. And then it surprises you by soaking up big hits with great composure. But the Versys is in another league. It feels sporty and composed but has an elegant answer to nearly every kind of road you encounter. It rapidly convinces you that slowing for obstacles is optional. That unwavering confidence is worth its weight in gold. 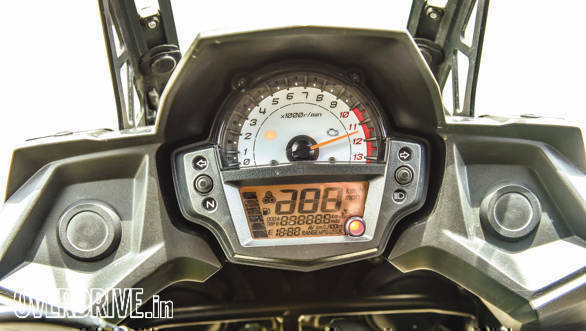 And let us not forget that the Versys' suspension is not only vastly more sophisticated, it also offers more adjustability which should further make its case as a supremely comfortable, India-ready open-road weapon. Touring? Lots of it? Forget the Triumph, you'll have to spend a lot of money to beat the Versys. This is where both the motorcycles are vastly different. 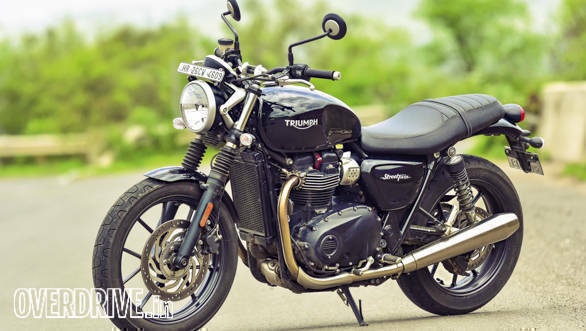 The Triumph Street Twin takes its middle name quite seriously. Its handling is competent but otherwise devoid of any high points. It's neutral and predictable but not very exciting  it isn't meant to be. The Versys 650 isn't very different. 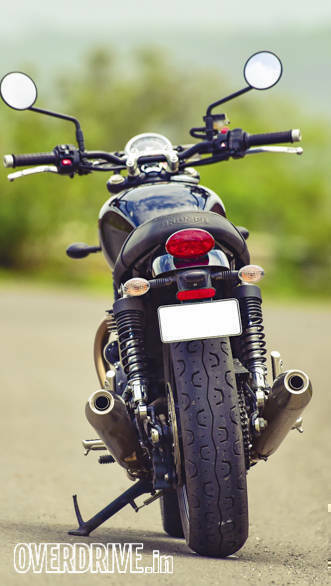 It's a stable motorcycle with friendly manners, but as you will discover, the height exaggerates your sense of the lean angles involved and you'll usually reach the edge of the tyres earlier than you think. 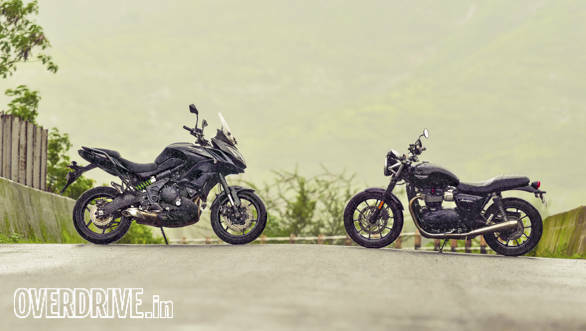 Both will dispatch the twisties and plant a smile in your face, but unlike something sportier like the Triumph Street Triple, it's not something they revel in - smiles all around but not laugh out loud. The Triumph is a very clear motorcycle in intent and that's a quality that I really, really like. It's a street motorcycle with a distinct sense of style, and it works hard at being a svelte, retro-cool, hipster-friendly motorcycle. Add Triumph's delicious selection of kits and bits and you can create some truly personal, deeply impressive customs. And if that is your thing, the Street Twin is the clear winner. The Versys is very dull if looking good and wowing the passers-by is your cup of joe. In the same breath, I have to say that I find the Street Twin a little less warm in sensation and emotion than the erstwhile Bonnie. Ashok, who's ridden the T120 as well as the Thruxton R, says that I'm on the money. And that the T120 feels emotive the way the old Bonnie used to. The Versys 650 is the winner overall. It is just vastly more competent. Its greatest issue is its seat height, and short inseams will find the motorcycle troublesome. That said, it's a problem you can learn to live with and I say you should. Because the sophistication of the suspension, the comfort and the ability are a phenomenal package. And when you enter the lower price, it's just very hard to say no to the Kawasaki. Ah yes, the prices. 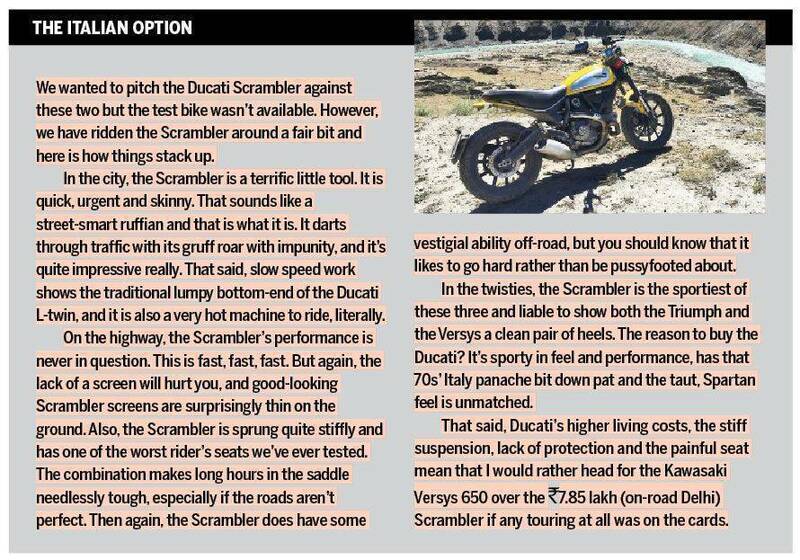 There's not much in between the Ducati Scrambler (see box) and the Triumph Street Twin. Both are Thai-sourced CBU motorcycles and suffer from the Maharashtra government's silly new tax norms. So in Delhi and Mumbai, on-road the bikes are roughly Rs 7.9 and Rs 9.05 lakh, respectively. The Versys is roughly Rs 7.3 lakh on-road in both cities making it a no-brainer in Mumbai on the massive price difference alone. In Delhi, the gap is much smaller in price but no less evident in the Kawasaki's on-road competence.